It will be interesting to see how the evening plays out as there was so much drama (prama!) surrounding this rite of passage. Perhaps the tension can be attributed to the stress of end -year finals, college decisions and the like. I'm more apt to believe that high school will always be....high school! Join us tomorrow morning on Reading With Robin 920AM from 7-8am (also streaming live at www.920whjj.com ) My guests will be (in no particular order!) 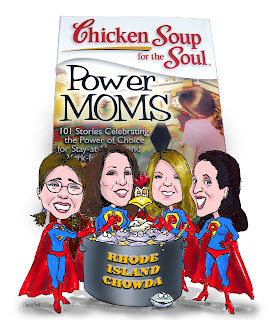 Lisa Tener, Kimberly Beauchamp and Erin Barrette Goodman...fellow Power Moms and from Families First RI - Sarah Sinclair and Lisa Kirshenbaum! Wendy Walker -our fearless editor will phone in to join in the conversation! Later on in the day please join us at NK Library 2pm to hear us talk about our stories -answer questions and books will be for sale to benefit Families First RI! And it continues.....Sunday May 3rd we'll be at the Southern New England Women's Expo (www.southernnewenglandwomensexpo.com) Doors open at 10am. I have tickets for $2 off admission so if you'd like one please email me at robin@readingwithrobin.com and I'll put one aside for you! Lots of fun stuff going on all day....hope I get to see some of it!